Just what every gardener needs – a nice big wheelbarrow. This vintage metal wheelbarrow drawing from 1867 might just do the trick. It was included in a magazine all about nature and growing things the American Agriculturist from February. It must have been so easy to maneuver around the garden with those great big wheels. It must have been so easy to maneuver around the garden with those great big wheels. But, I suspect it was quite heavy, even before it had anything in it. It looks almost dainty in some ways with the thin, bicycle-like wheels. And yet, that big metal tub looks ready for most anything. I’ve corrected this one a bit but have left the simple shadows and ground that it appeared with all those years ago. 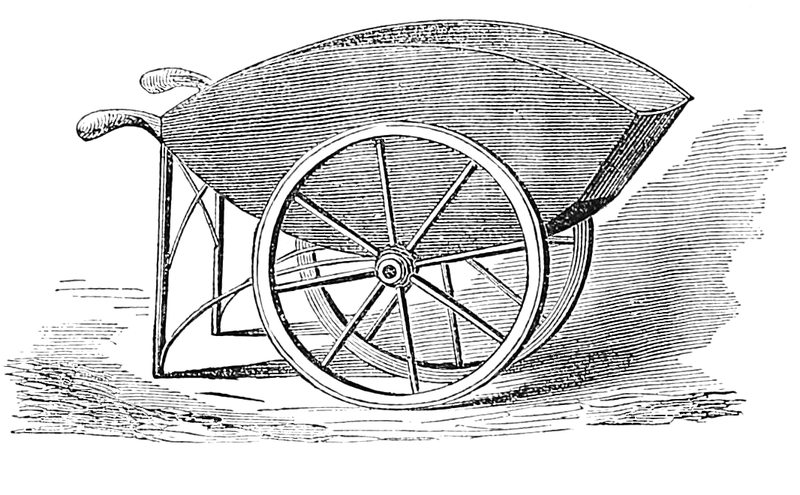 Perhaps you could overlay this metal wheelbarrow drawing on a gardening image to create something even better. Perhaps you could add some flowers to the metal wheelbarrow to create a piece of wall art. The most important thing is to have fun. And, if you get a chance, let folks know you found this awesome vintage gardening image on ReusableArt.com.